In a world that doesn’t have ambient-sound-based-volume-adjustment, FoxyRing Does! Okay, so maybe advertising isn’t for me, but FoxyRing definitely is. Currently one of the top 20 contestants in the Lifestyle category of ADC II, this app has a good chance of walking away with one of the prizes. 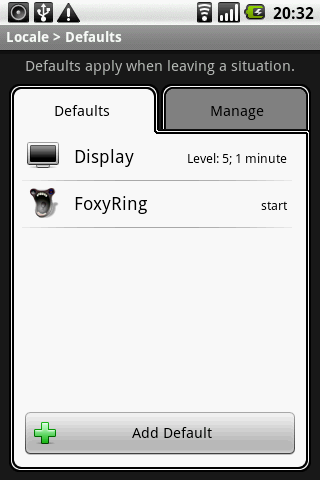 Where ADC I had Locale as the revolutionary condition-based-settings-manger, ADC II now has FoxyRing. According to its description “FoxyRing periodically auto-adjusts your volume settings based on the ambient background noise”. What this basically means is that your volume settings will be set to such a level that your phone never goes off too loud or too soft. When first installing FoxyRing, the user is asked to calibrate the application in a silent environment. After that the application will periodically analyze that calibration versus the current sound levels and adjust the volume of your ringtone and notifications accordingly. The user can set the frequency of these analyses and set the minimum and maximum volume. The short answer here is; a lot! 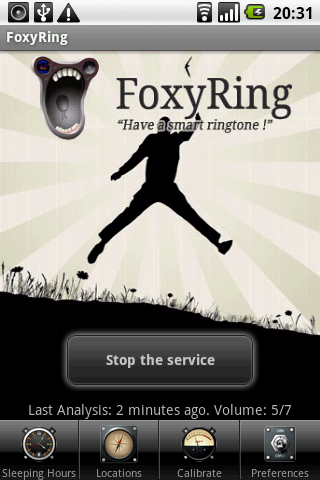 Just like in Locale, FoxyRing allows the user to define locations that have a custom ringer mode or ringtone. 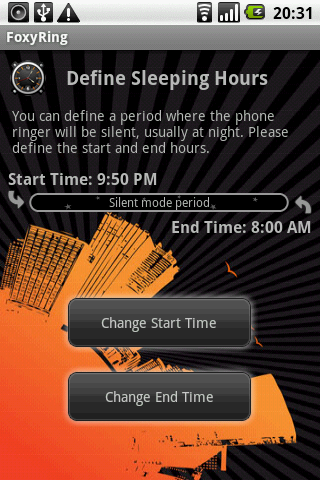 FoxyRing also allows the user to define sleeping hours in which the ringer is turned off and battery life can be saved (the creative user could ofcourse also use this option to change settings during his nine-till-five-job). Considering that the developer of FoxyRing is also the developer of the popular ‘Beautiful Widgets’-packs, it would be surprising if FoxyRing didn’t include a nice widget (so it has that too). Considering the above mentioned similarities it is nice to see that FoxyRing can actually be used as a plug-in for Locale and doesn’t just compete with it. What this means is that Locale and FoxyRing can complement each other, Locale offering the pre-defined organized part of life and FoxyRing offering a nice solution for the random parts. So what else is down the pipeline? According to the developer, incall volume is also in the works so you never have the inconvenience of having your girlfriend declaring her ‘love’ for you a little too loud on your end of the line. Also, the developer is working on a VIP-feature so a set of pre-defined persons can in fact still call you during the night. You never know when a loved one (or Boss with capital ‘B’) needs to reach you right? 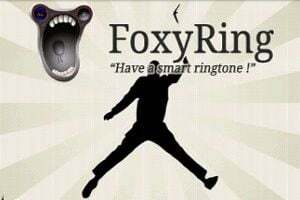 FoxyRing offers some really cool functionality that can complement any android phone. It has a freakin’ sweet UI and is in the Market now! Ow, did I mention all this sweetness is free?! P.S. Given the fact that it is free, show it some love when you come across it in the ADC II! This was a guest blog-post from one of our readers. Thanks for the tip and write up Roy!